Our Healthy Community aspiration is that the region is known for an active and healthy lifestyle. A healthy region is essential to building a productive society. Every community needs a healthy workforce upon which to build its economy, healthy students better equipped to learn and succeed academically, and healthy citizens able to fully participate and contribute to society. First, we support work around prevention through healthy food access and healthy living. Moving forward, we are also promoting and supporting efforts around behavioral health and data sharing. 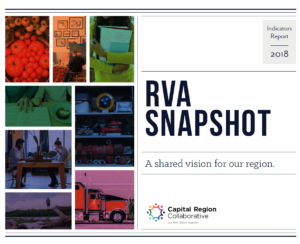 Active RVA strives to make Richmond the most active region in the country by improving the quality of life in the Richmond Region through active living. The RVA Food Collaborative is a forum for communication, collaboration, and collective thought on food system issues in the Richmond Region.